Rose Coschignano/Pipe Dream Photographer Following one of its best regular seasons in school history, Binghamton looks to find success at the AE Championship. 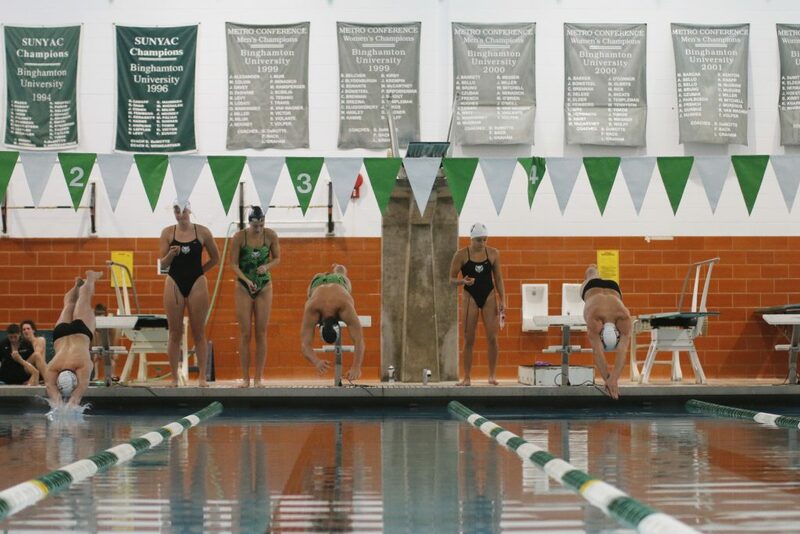 The Binghamton swimming and diving teams have undeniably put together an impressive regular season. The squads look to finish the year on a high note this Thursday, as the four-day-long America East Swimming and Diving Championships take place. Last February was the AE’s first time hosting a men’s championship meet since 2012, and the Bearcats were the runner up behind champion UMBC. This year, the men (4-1) feel more prepared and are hungry to prove themselves. “We’re comfortable with the venue, comfortable with the competition, and we’re fired up,” senior Zachary Kaplan said. Kaplan swam a personal best in last year’s tournament in the 100 fly (51:35), placing eighth, while senior Alex Brion placed second in both the 50 free and the 100 free. In the 2018-19 regular season, Brion broke pool and program records, including the pool record for the 50 free at the Colgate meet. Junior Ross Bernstein also garnered two second-place finishes last year, in the 400 IM and the 200 fly. This season, Bernstein broke David Holmes’ 2006 record in the 200 fly, and joined forces with Brion and sophomores Shane Morris and Patrick Wilson to set a new 200 medley relay pool record at home. According to their coach, the triumphs of individual swimmers may have evoked a team-wide sense of self-assured determination. The women (7-1) have also amassed a high degree of success this season. En route to a fourth-place team finish at last year’s championship, senior Brooke Pettis captured the 100 fly and placed fourth in the 200 fly, and this season, she helped the 800 free relay team shatter a record set by the University of Vermont in 2006 by nearly seven seconds. Sophomores Erica Bachiller and Kaitlyn Smolar each surpassed freshman records in the 200 backstroke and the 1000 and 1650 frees, respectively, at the 2018 championships. Smolar broke a six-year standing program record in the 1000 free this season. She, junior Olivia Santos, along with teammate Brion, were each named the America East Swimmer of the Week, and Smolar earned the title twice. Not to be outdone, BU divers have compiled a great year following their positive experience at last year’s championship meet. Sophomore David Walters took the one-meter diving event and placed third in the three-meter competition last year, and was named Most Outstanding Diver. He has qualified for this year’s NCAA Zone Meet, and will be joined by sophomore Sophia Howard and freshmen Chris Egan and Amanda McGraw. It is not just the team’s paper achievements that have given the swimmers confidence entering the championships, but an intangible energy and a mindset that Smith has instilled in his athletes. The team appeared eager to perform well for each other and to capitalize on the momentum built by their final, dramatic home victory over St. Bonaventure. “We’ve definitely grown closer this season, and coming off the [St.] Bonaventure win has gotten everyone’s energy up at just the right time,” said junior Rebecca Nelson. Ideally, for the teams, that energy will translate into a strong meet and positive results for the Bearcats at this year’s AE Championship. The event will take place from Thursday, Feb. 14 to Sunday, Feb. 17 from Worcester Polytechnic Institute in Worcester, Massachusetts.